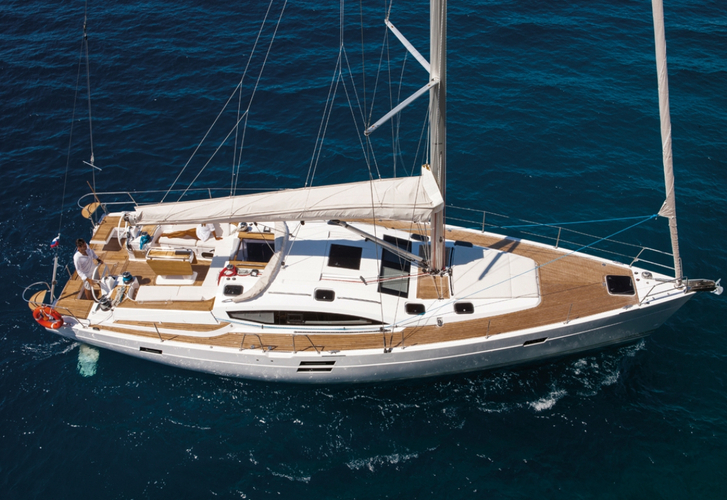 Yacht Elan Impression 50 named Alboran Mai-Tai (Majorca) has been produced in 2015. We offer this boat from marina Palma de Mallorca just a few kilometers from Palma De Mallorca. Alboran Mai-Tai (Majorca) is registered for 10 passengers. Layout of the sailing boat is 10. Elan Impression 50 Alboran Mai-Tai (Majorca) is equipped with 5 cabins. For comfort of passengers there are 2 toilettes. You can fill the fuel tank with 295.00 l liters and in tank for water it goes even 605.00 l l. With engine 75 hp Alboran Mai-Tai (Majorca) can sail really fast. Alboran Mai-Tai (Majorca) is 15.20 meters long and 4.68 meters wide. Depth is 2.23 m. Click for more search results by going to the section Yacht charter Palma de Mallorca. Sailboat's equipment involves : Autopilot, Gps plotter, Bimini top, Dinghy, Anchor electric windlass, Bow thruster, Radio / cd player. . Security deposit is 2500.00 EUR. Choose our offer and have fun on the deck of Alboran Mai-Tai (Majorca). This Elan Impression 50 from Palma de Mallorca from Balearics You can search by navigating to the section Yacht charter Balearics.